Thanks to a heads up from a colleague, I and my class have been messing around with pbwiki at http://www.pbwiki.com/ Here you can make a free password protected wiki they say, "as easily as a peanut butter sandwich". Actually it is pretty easy and some of my grade 3/4's have taken to it like a duck to water. You can see their 2 day old handiwork at http://middlej.pbwiki.com/ . What's a wiki? It can be just about any sort of web based collaborative exercise you want it to be. We are sort of making a glossary based exploration of minibeasts in our wiki, check it out. Have been a bit lax of late getting onto blogger, (this is mainly because I have been messing around with other things bloggy and beyond). The Science at the Shopping Centre in Westfield Bay City Plaza was a real hoot. Westfield did a great publicity job. 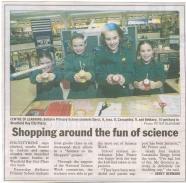 The kids had a lot of fun too as this article from the local Geelong Advertiser shows. 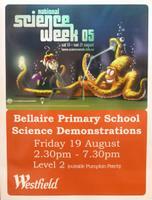 Next week is National Science Week. We have been fortunate at school to have gained some funding to mount an expo at a local Westfield shopping centre. 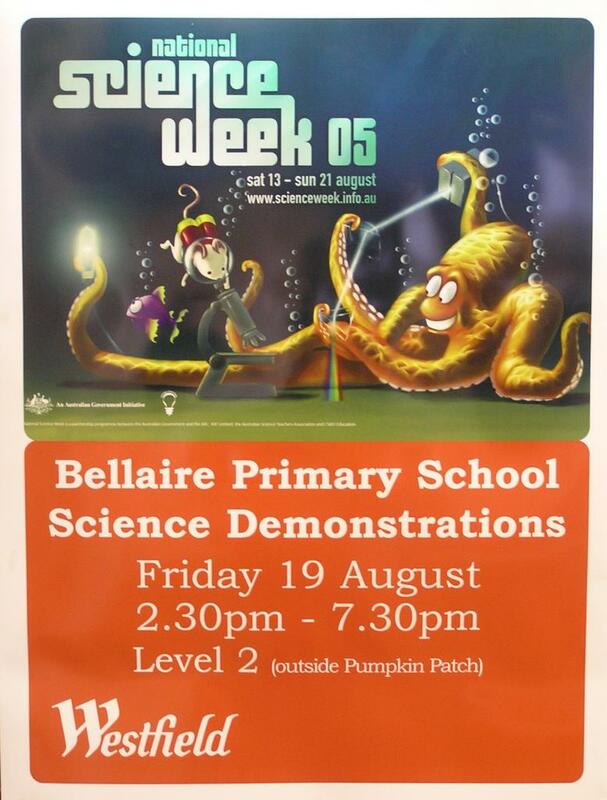 We have called it Shopping Centre Science and will involve some 24 student volunteers from grades 3-6 at my school Bellaire Primary School. I will post more details later. Though it isn't really science, I have recently added some Flash based animated Maths Strategy Games to the Other section of the Simply Science Site. You can either play them online or download a Word doc version to play at your table. One of most popular aggregator today is Bloglines. Bloglines is web based, you don’t need to download any software to your computer. Just create an account on their website and subscribe to your favourite blogs. You can then follow your blogs from a Mac at home, a Windows PC at office or a PDA at some airport. betterdays � Blog Archive � Using Bloglines (or How to keep up with dozens of blogs everyday) tutorial will show you how to sign up and subscribe to blogs with Bloglines. It also shows you some other interesting things you can do with Bloglines.